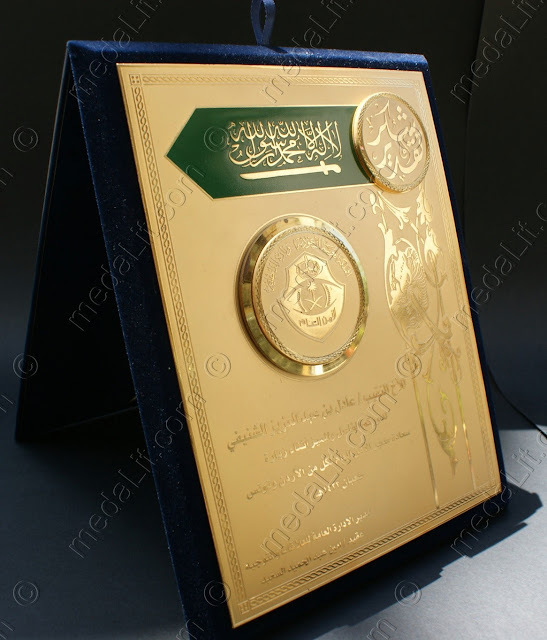 Absi gold-plated plaque awards features 24 K gold-plated brass plates 1 mm in thickness and are characterized by a matte background and semi-polished raised text and graphics which creates a two tones effect called highlighted-finish. In addition they offer very precise high quality etching in which the plaque background is sunken into the plaque leaving every minute detail in your design to stand in relief from the sunken plaque surface. You can choose from more than 70 different templates and personalize it with your logo and text, or send your own layout and design. Text and other design elements are usually not colored as exposing the rich gold-plated areas is favorable. After the plaque is gold-plated as a whole a thin layer of lacquer coating is applied. 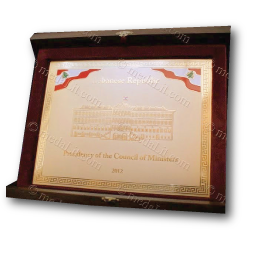 The plaque is mounted on a wooden stand covered with velvet and is treasured in a luxury wooden box with velvet-covered interior.